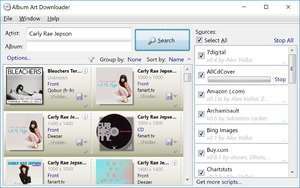 The Album Art Downloader is a software download designed to make life easier for anyone who wishes to find and update their album art for their collection of mp3s. The sources for the pictures can be defined by creating plugin scripts. It features a simple and easy to use search method that lets users search for album cover using the artist and album name. Users can also further narrow their search by adding filters such as cover type and image size. Version 1.03 is a freeware program which does not have restrictions and it's free so it doesn't cost anything. For security reasons, you should also check out the Album Art Downloader download at LO4D.com which includes virus and malware tests. Additional screenshots of this application download may be available, too. Album Art Downloader download been highly rated by our users.